The Islamist zombies had been at it again (in Brussels) and I was off - at the end of the same day - to see a play about suicide in Salford. More pressing tasks sprang to mind. Like the washing-up. But I needn’t have worried. The play was less about nihilistic self-destruction than the havoc wreaked upon those left behind. In ZERO, by Robin J Lyons, those left behind are brother and sister. Their father jumped from the bridge where they meet to scatter his ashes. Eddie is a binary guy with a bloke-ish disdain for counselling and compassion. Helen has less time for heroes and more time for their bereaved mother. Such mad antics aren’t fully explained. They don’t need to be. It is the legacy that matters, as taken up by Eddie and Helen in convincingly different registers. They need each other to make sense of what happened and bring the grieving to an end. Their lives have been altered by their father’s darkness and if they can just scatter his ashes they might contain the demons he unleashed. But then along comes Tim (Eddie Bower) and everything is changed. I’ll say no more, because to do so would spoil a fine plot. If I tell you he’s a cyclist you’ll know he’s on the side of the angels, but whilst the bulk of the dialogue belongs to the siblings, Tim's twist is axiomatic. Dean Gregory (Eddie) and Rosemary Terry (Helen) are excellent, articulating flash-backs and asides with precision and flare. They know every angle and never hold anything less than our full attention. 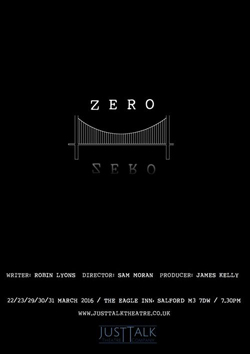 In such a confined space as the Eagle in Salford – a cosy back-street pub with great beer – the audience catches every breath and gesture. Such proximity would be oppressive if the drama didn’t hold us tight, especially when the action is almost in your lap! But there is deftness and energy in the script, which punches intellectually high whilst also raising a laugh at the craziness of a family that seems to have stood Christianity on its head by hanging-out with Satan on a Sunday. For the preview night of a new play the standard was really impressive, delivering crisp, punchy theatre in a pocket-sized venue. A little less haste toward the end would give the audience more time to digest the magnitude of what is being proposed, but in all other respects the dynamism of the piece, lasting less than an hour, is just right. Questions bubbled to the surface the moment the zero hour was reached. I might not find satisfactory answers to all of them within the play, but their raising is enough. Catch this while you can, and in the process raise a glass to the life-affirming wonders of original theatre, lovingly realised by fresh young talent.